Athens, Ga. – More than 150 agricultural leaders from across 13 Southern states and Washington, D.C., converged on the University of Georgia’s campus in Athens on Feb. 8 to discuss leadership roles for women in agriculture. 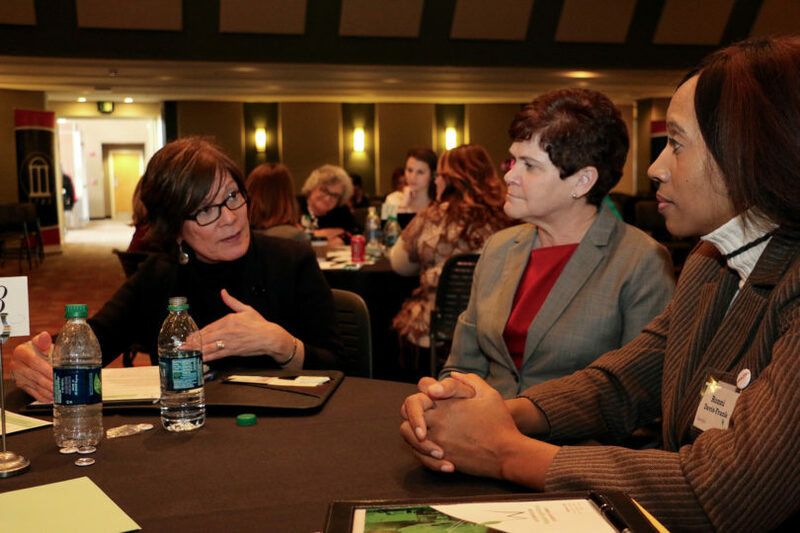 Women representing government agencies, farms, the Cooperative Extension System and agriculture-related industries were invited to participate in the UGA-led Southern Region Women’s Agricultural Leadership Summit. Participants were chosen because of the leadership roles they play in their home states. One of the goals of this summit, which was sponsored by the UGA President’s Venture Fund, the UGA Women’s Leadership Initiative and the College of Agricultural and Environmental Sciences, was to put these agriculturally minded women together to share their leadership experiences and document the barriers they have overcome. “The university’s role as host of this extraordinary gathering underscores our commitment to increasing the number of women in leadership roles in agriculture,” said Pamela Whitten, UGA’s senior vice president for academic affairs and provost. Agriculture is slightly behind the curve in cultivating female leaders, said Krysta Harden, U.S. Department of Agriculture deputy secretary, a Georgia native and UGA alumna, who told the audience that she was only the third female deputy secretary at the USDA in 150 years. In boardrooms, on commodity commissions and in state growers’ associations, the track record is not much better. “How many bright, talented women have been passed over (through) the years? That’s why we’re here,” she said. Harden moderated a panel of female agricultural leaders to kick off the summit, and each shared key events and struggles that had shaped her path. They urged women to step out of their traditional roles and to take a seat at the table. Panelists, delegates and Harden continually touched on the need for today’s leaders to support young women—and for professional women to support one another—through formal advocacy organizations and informal mentoring relationships. The summit concluded with facilitators from the university’s J.W. Fanning Institute for Leadership Development asking delegates to discuss three questions on what is needed to support leadership activities for women in agriculture; what people should stop doing that causes barriers to women having leadership roles; and what people should start doing to support leadership activities for women in agriculture. The results of the institute’s findings from the summit will be compiled and released as a formal public report within the next three months, in addition to academic papers describing their data. Summit organizers will also release a how-to blueprint for women who want to hold similar women’s leadership summits in their hometowns and counties and a best practices guide for policymakers and agricultural stakeholders about how to support female leadership. A similar guide will be developed for women working in agriculture in order to help develop their leadership skills and to support other women in doing the same. These documents will be publicized and circulated as they become available. For more information about the summit, visit www.caes.uga.edu/events/womensagleadershipsummit.